Additionally, there are many opportunities to gain leadership skills through community engagement. 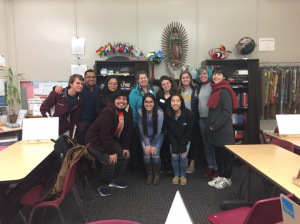 Service-Learning Student Coordinators lead volunteers in weekly service, facilitate reflection sessions, and foster a positive service-learning experience. Student Coordinators receive on-going support from Shriver Center staff and their peers and benefit from bi-weekly training meetings. Contact The Shriver Center to make an appointment with a Service-Learning Team member. Call the front desk at 410-455-2493 or visit The Shriver Center on the first floor of the Public Policy Building (Monday-Friday, 8:30am-5pm). Meet with a Service-Learning Team member to review the 096 Community Service & Learning Syllabus. Decide on your service site. Many require you to take additional steps before you are able to serve, such as completing a volunteer application, background check, health clearance, and/or interview. The Service-Learning Team will connect you with the site to complete their respective selection and/or orientation process. Your site supervisor may be a staff member or volunteer coordinator at the community organization, either a non-profit or K-12 School; some service placements are led by UMBC Service-Learning Student Coordinators. Once you are selected and/or complete the necessary steps to begin at the site, prior to getting started, complete the Orientation Quiz on Blackboard!